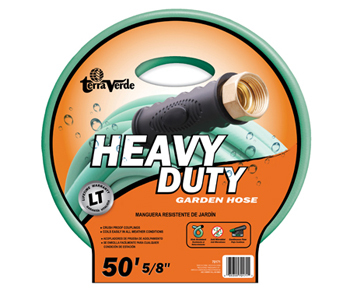 Extra strength heavy-duty garden hose offering premium quality with double spiraled reinforced construction with extra vinyl jacket. Coils easily in all weather conditions. Crush proof couplings with premium faucet collar, kink resistant hose with continuous flow feature and Anti-Microbial protection fights mold and mildew. Lifetime warranty. 5/8" diameter. Green.